Pandaw River Expeditions has become the first Western operator to reach China's Yunnan Province via the Mekong River, when the RV Champa Pandaw moored yesterday at Guanlei. The Champa Pandaw, which has 14 teak-finished staterooms, was specially built to withstand the strong currents and challenging navigational conditions of the Upper Mekong and deliver Southeast Asia's first ever "four country" river expedition. Running from Oct-April, Pandaw's 14-night cruise The Mekong: from Laos to China operates upstream and downstream between the Lao capital Vientiane and Jinghong in China, via moorings in Thailand and Burma. The cruise is the latest in a long line of pioneering river expeditions from the company which, since its foundation in 1995 has led the way on high-end experiential cruising on the rivers of Asia. Champa Pandaw is the latest edition to Pandaw's growing fleet of unique, colonial-era ships. Built and finished to the highest levels of engineering and craftsmanship 17 of the ships currently ply Asia's waterways, including the Irrawaddy, the Chindwin and the Mekong rivers. 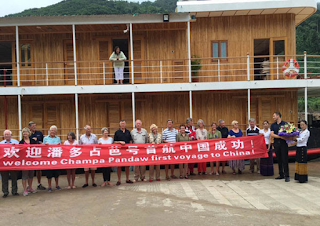 Paul Strachan, Pandaw's founder said: "It has been a long-held dream of ours to offer travellers the chance to journey on a Pandaw ship on the Upper Mekong all the way to China, so today marks a major milestone in our history". "We have faced many challenges developing this new and exciting route into Yunnan Province and I would thank all our team and partners for their part overcoming the difficulties to make it happen. "Exploring the Upper Mekong on a four country river expedition from Laos to Thailand, Burma to China is a fascinating and unforgettable off the beaten track adventure, and passengers make the trip knowing that they entering exciting new territory." Tony Deng, Managing Director on China Kindness Tour, Kunming, Pandaw's partner in China said: "The arrival of the Champa Pandaw marks the beginning of a new era on Mekong River, and its an honour to be playing a part. We are very pleased to be partnering with a company of Pandaw's reputation on the Mekong in China. We see this as an important way of opening up Yunnan Province, which is, to high-end experiential tourism "
"Bigger than the entire country of the Netherlands or Denmark, with a population of 45 million, Yunnan Province has so much to offer the traveller, from glorious mountain scenery, fabled cities such as Lijiang, Dali and Zhongdian, also known as 'Shangri-La'. It is also home to over 50 ethnic minorities". Pandaws' four-country river expedition allows passengers to enjoy discovering charming villages and experience stunning scenery amidst pristine jungle. Highlights include the Golden Triangle, spectacular defiles, the Tat Kuang Si waterfall, and the very emerald green waters of the Mekong in China's Yunnan province. The journey includes overnight stops in Vientiane, Luang Prabang, Chiang Saen and Jinghong. Built in a specially created shipyard on the Burmese Mekong, using a methodology and design based on Pandaw's unparalleled knowledge of local riverine conditions, the Champa Pandaw was designed with ultra-low draft and extra powerful engines generating 1400 horsepower, almost twice the power of other ships in the Pandaw fleet.